Flash your Microbiology skills ! A flashcard is any of a set of cards bearing information, as words or numbers, on either or both sides, used in classroom drills or in private study. One writes a question on a card and an answer overleaf. Flashcards can bear vocabulary, historical dates, formulas or any subject matter that can be learned via a question and answer format. Flashcards are widely used as a learning drill to aid memorization by way of spaced repetition. 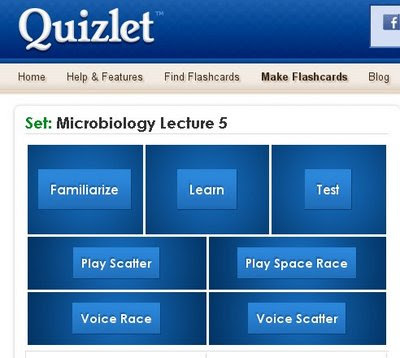 At Quizlet, you can browse and use millions of flashcards created by other students and teachers, or create your own. 1. Familiarize Mode, that gives you a taste of the material before diving in. 2. Learn Mode is the most powerful study mode, keeping track of your scores, retesting incorrect answers, and letting you pause and resume study sessions. 3. Test Mode is the most versatile study mode, supporting short-answer, matching, multiple choice and true/false testing, or any combination. It also scores your answers with easy-to-read corrections. 4. Scatter is a fun matching game which lets you drag and drop questions and answers with your mouse while racing against the clock. 5. Space Race is the ultimate video game study simulation. Racing the clock, you type in answers to questions flying overhead before they evade your grasp. You can find more Microbiology & other lifesciences related flash cards by search option.